As you push yourself towards your fitness goals, you need a partner that you can count on, and we're happy to say that the Sirrus Sport fits the bill. It's constructed from a durable, reliable, and lightweight A1 SL Premium Aluminium, and it features a bombproof assortment of components, like a Shimano Sora rear derailleur and powerful Tektro hydraulic disc brakes that are sure to get the job done. Sprinkle in some added comfort from Specializeds proven Body Geometry components, like the grips and saddle, and a Fitness geometry that lives in the sweet spot between comfort and performance, and you have a bike that'll always be ready to go when it comes time to sweat. As you push yourself towards your fitness goals, you need a partner that you can count on, and were happy to say that the Sirrus Sport fits the bill. Its constructed from a durable, reliable, and lightweight A1 SL Premium Aluminium, and it features a bombproof assortment of components, like a Shimano Sora rear derailleur and powerful Tektro hydraulic disc brakes that are sure to get the job done. Sprinkle in some added comfort from Specializeds proven Body Geometry components, like the grips and saddle, and a Fitness geometry that lives in the sweet spot between comfort and performance, and you have a bike thatll always be ready to go when it comes time to sweat. > The lightweight FACT carbon fibre fork provides a smooth, responsive ride, while the Plug + Play fender mounts give you the option to install rain-fighting fenders. > Braking duties are handled by Tektro hydraulic disc brakes to ensure effective, consistent, and reliable power through any kind of terrain or condition. 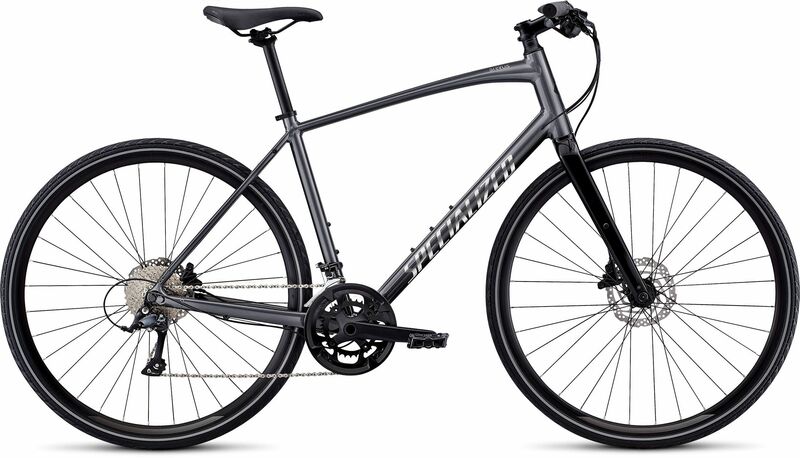 Please see below for delivery options for Specialized Sirrus Sport Alloy Disc City Sports Hybrid Bike 2019.